Your garden need not be a forgotten wilderness throughout winter, simply left awaiting the first buds of spring. Many plants are at their best during winter providing colour; scent or textures providing interesting vistas from the window or delicious scented surprises to those who choose to walk around the garden. Winter is when the trees and shrubs come into their own, creating strong focal points in the winter garden. Without the plethora of summer blooms and foliage to distract the observer, the winter garden is an opportunity to enjoy different aspects of the garden such as the textures and colours of the bark of trees and alternative shapes of familiar plants once the leaves have fallen. Seed heads also add a great addition to the garden that is unique to winter due to contribution of weather, in particular ice and frost. The heads of myscanthus become magical when covered in a light dusting of frost for example and the dead flower heads of hydrangea are echoes of the year just past. They add such texture and character. The seed heads of many late summer flowering plants provide a great feature such as the wonderful structure of the phlomis tuberosa ‘Amazone’ and the lunaria annua (Honesty). These, accompanies by the grasses create a unique sceptical. The oranges, reds and yellows that enrobed autumn are in part replaced by a variety of greys and silvers. This is very atmospheric especially early on a winter’s morning. 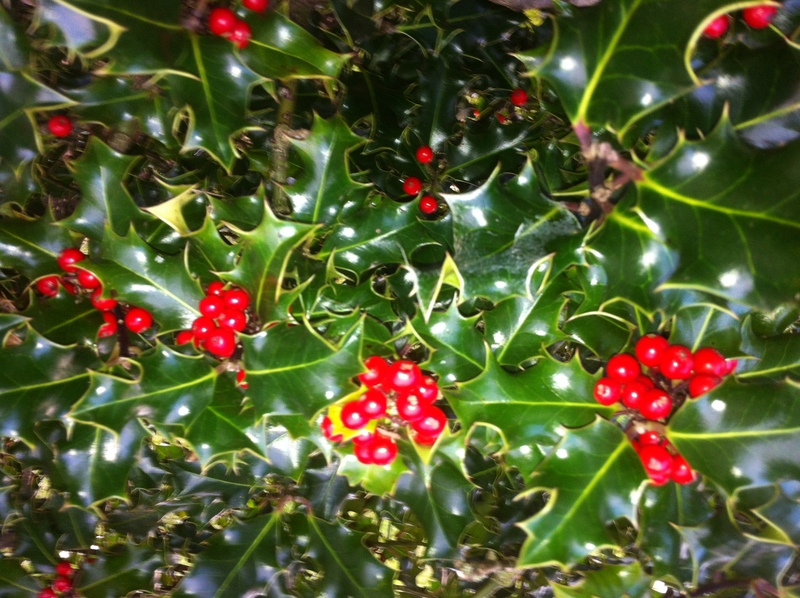 Although berries are really the fruit of autumn, many hang around well into winter. The most obvious being holly. This picture I took on Christmas day. The bush was amassed with berries. 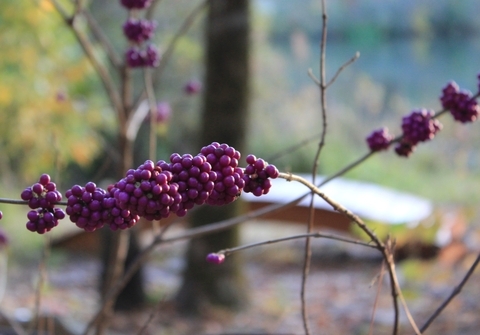 Similarly, the fabulous magenta Callicarpa berries shown below stand out once the leaves have dropped and the aptly named snow berries, although they are produced in late summer, seem to be untouched by the birds until winter. Wintertime is a time for several varieties of plants to flower. In a lot of occasions these also have a strong scent that on a sunny winter’s day fills the garden with rich spicy sweet scents. Winter flowering jasmine, the Mahonias, Cornus mas, Chimonanthus praecox (Wintersweet) and the glorious Hamamelis (Witchhazel) all provide a profusion of yellow flowers. All of these also provide wonderful scents. As with Cornus mas and the varieties of Hamamelis, the flowers of Prunus mume ‘Beni chidori’ ‘Japanese Apricot Tree) bloom directly from the bare branches in late winter. This time the flowers are the deepest pink in colour with an almond scent. Another three stars in the flowering group have to be the Christmas Box or Sweet Box, Sarcococca confuse; Viburnum x bodnantense ‘Dawn’ and the wonderfully scented Daphnes. With careful positioning, the impact of coloured foliage can be just as dramatic and interesting in winter as it is in summer. 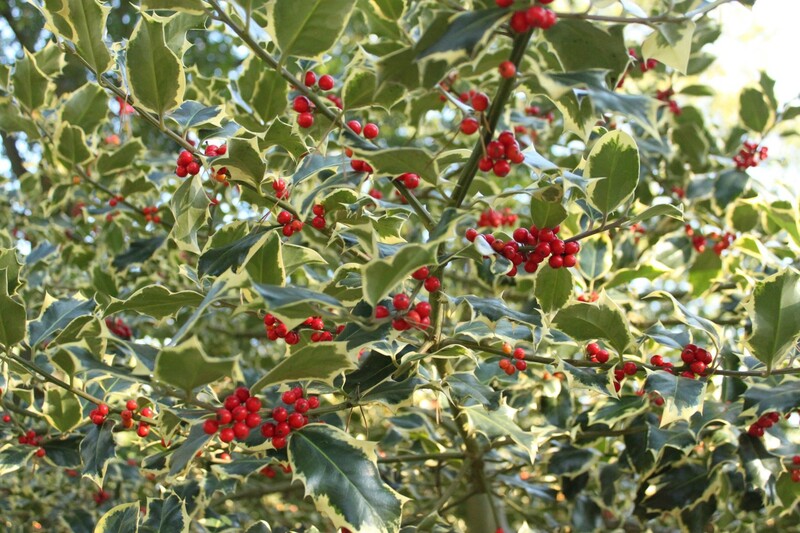 There is a lot of variegated leaves on evergreen shrubs that provides their own contrasting colours. The Ilex aquifolium ‘Argentea Marginata’ is a silver edges Ilex which is particularly attractive. If you prefer a warmer combination, Ilex x altaclerensis ‘Golden King’ has a soft golden edge contrasting to the main part of the dark green leaf. Lower to the ground a great combination is the green and cream variegated Arum italicum subsp. italicum ‘Marmoratum’ growing alongside Tellima grandifolia ‘Rubra Group’. The mixture of deep pink Tellima leaves contrasts beautifully with the Arum. I mentioned Sarcococca confusa earlier. This is a pretty dull shrub on its own. It is planted to provide the strong sweet scent from its spidery white flowers. However, plant it along another somewhat uninspiring shrub Euonymus fortune ‘Emerald Gaiety’ and things start to look interesting. Front plant with groups of snowdrops and under plant with pure white daffodils such as Mount Hood you result in creating a fantastic green and white bed for winter and spring. To introduce other foliar colours into the garden, consider the purple leafed Mahonia – Mahonia aquifolium ‘Atropurpureum’; the red sedge Carex buchananii which looks wonderful frosted; a favourite Bergenia ‘Overture’ whose waxy glossy leaves turn deep red in hard winter. That just leaves the use of stems to introduce colour. The two species that lead the field in this area are the willows and the dogwoods. Have a look at my previous blog to see the fantastic reds, purples, oranges and yellows. 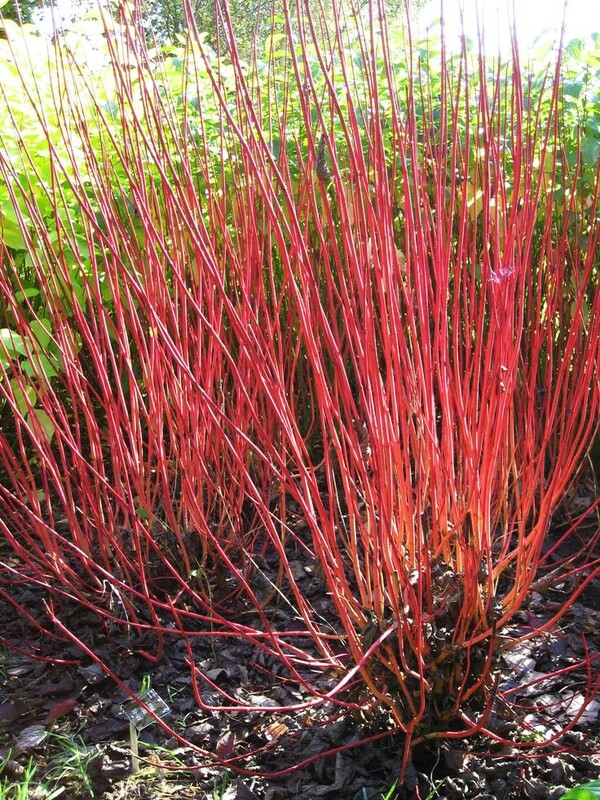 Basically every garden should have a number of these plants as an easy back drop for their winter garden. In summary, with a bit of planning and careful selection, you can have as wonderful a garden in winter as you can have during the other seasons.